The gist of the problem behind the wave particle duality is that electrons and photons can behave as particles or waves depending on how an experiment is performed. When they hit a detector they appear as single point particles; however when they come through the apparatus they can show wave-like behaviour such as interference, reflection, diffraction etc. that is apparently impossible to explain with particles. This causes an issue with the idea of what a photon (or electron for that matter) actually is at the fundamental level. It is only after listening to, and reading, Feynman’s lectures that I find that there is no problem of a wave particle duality, electrons and photons are definitely particles and in no way waves, and it is only through misrepresentation that this “problem” exists. The proof of the particulate nature of light came in 1905 with Einstein’s paper on the phototelectric effect. This effect involves shining a light of a single frequency onto a surface of atoms and seeing if any electrons are excited out of their orbitals. As you decrease the frequency of the light you decrease the number of electrons coming out, however at some cut-off no more electrons are emitted. What is slightly odd is that the energy of the emitted electrons doesn’t depend on the intensity of the light. Classically, the intensity of a beam of light is related to its intensity, so if light were truly a wave and you were below the frequency cut-off you could increase the intensity and eventually enough energy would be transferred for an electron to be excited, but this isn’t the case. The way this is explained is that light can only carry discrete packets of energy which can only interact with the electrons one at a time, and so no matter how many you have, if the frequency (and hence energy) isn’t correct you’ll never get any excitations . This photoelectric behaviour can only be explained by a particle view of light. In order to explain why there isn’t a problem of a wave-particle duality it would probably best if I first explained what the problem is commonly quoted as being (especially after using the last paragraph to outline why light has to be a particle). 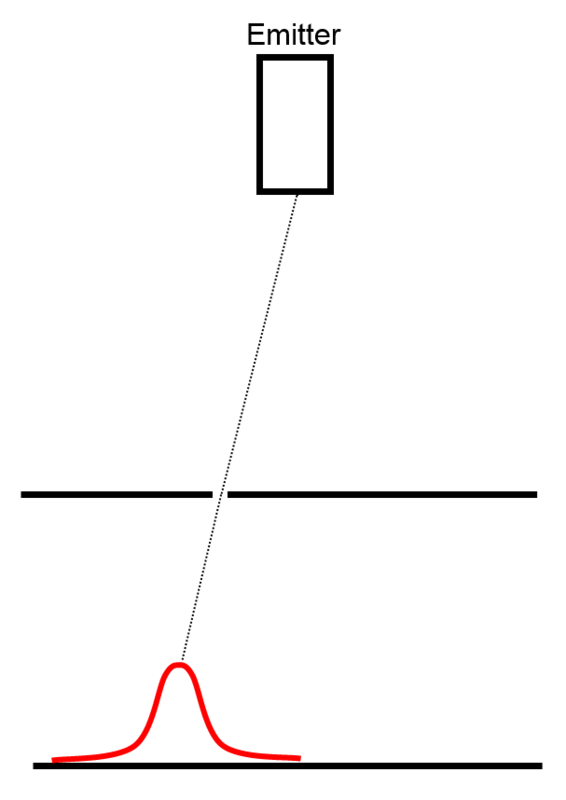 The most common example is usually given through Young’s double slit experiment. Essentially the set-up consists of a device that fires a series of electrons or photons one at a time at a screen that contains some slits, beyond which is another screen that can detect the arrival of a single photon or electron. When a single slit is open the pattern that is built up over time on the screen is one that everyone would expect; a nice high-intensity peak located behind the slit with diminishing intensity either side. The interesting effects occur when two slits are open. Rather than getting two high-intensity peaks behind the locations of the slits you get an pattern with peaks all over the place. Some places get a higher amount of hits than before and some areas that did get hits now don’t! And bear in mind that only one electron or photon is going through the set-up at a time. For a long time this couldn’t be explained with particles, and what’s really unfortunate is that this looks exactly like the interference pattern you get with waves. Quantum electrodynamics explains the double slit experiment through probabilities. It turns out that it is impossible to know where exactly an electron or photon has moved, all we can do is calculate the probability of where it will end up . In order to try and explain this I’ll be using the example of dice. What are the odds of rolling a total of 4 on a six sided dice? Hopefully you’ll have all said 1/6th. Fairly simple to get your head around, one possible outcome you want out of six different possibilities. This is like the case with a single slit, the particle has a certain probability of hitting each part of the screen by going through the open slit. This probability is largest right behind the slit and lower away from this region. So how does our dice analogy explain the change with the second slit? The question now becomes what are the odds of rolling a total of 4 on two six sided dice? To work it out you just add up the probabilities of all the possible ways of getting a total of 4, which in this case is 3/36  or 1/12. Is it odd that this is a different number than the case with one dice? Is it strange that the odds of rolling a total of 1 have vanished? This is analogous to the case with 2 slits open. 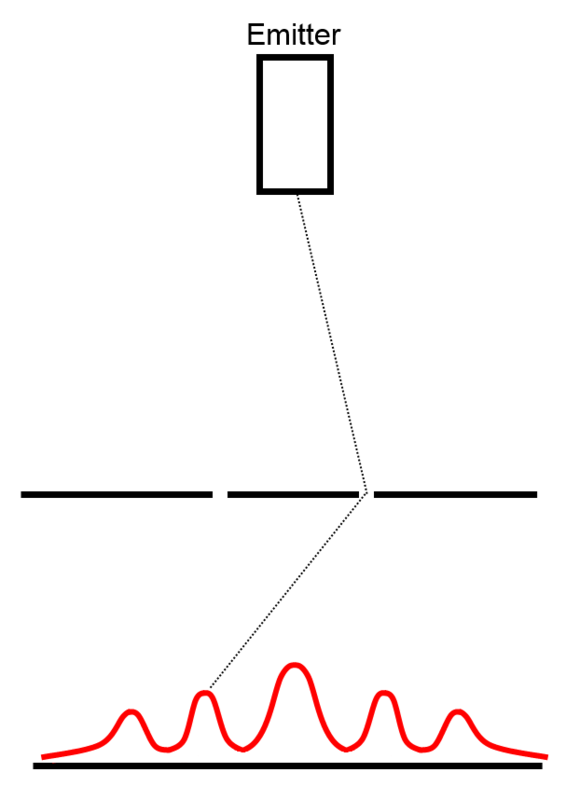 The probability of a particle arriving at a given point at the second screen will now have a contribution from the path through the second slit as well as the contribution from the first one. There is no more wavelike interference going on in the double slit experiment than there is in the case of rolling 2 dice. By opening the second slit you’re changing the experiment and so it shouldn’t really be surprising that the results change. Reflection, refraction, diffraction, lenses, every last drop of physics concerning light and electrons is described by this probability method with an accuracy and completeness that no other theory can match. All of this leaves me wondering why it is not more well known (if not the theory then at least the resolution of the wave-particle duality), especially amount the scientific community I’m part of. After learning about this description of the nature of electrons and photons I’ve looked elsewhere for confirmation of it’s validity (the lectures were given in 1979 and a lot can happen in 34 years). As far as I can see the wave-particle duality is still presented as the confusing and weird reality of quantum mechanics, with no one showing that all the apparent wave behaviour is explainable with particles, or more importantly that some of the behaviour is only explainable with particles. Maybe after more looking I’ll find that Feynman’s Nobel prize winning and worlds most accurate theory is incorrect and there is a wave-particle duality like everyone else says, or maybe someone will correct me in the comments, but I think this is just a simple case of a perpetuated misunderstanding.